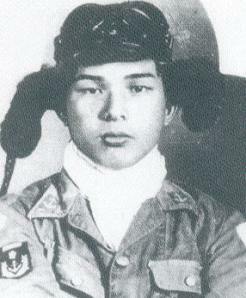 On March 18, 1945, Flight Petty Officer 1st Class Takao Motokariya took off from Tsuiki Air Base as a member of the Kamikaze Special Attack Corps Kikusui Unit Ginga Squadron and died in battle to the southeast of Kyūshū at the age of 19. Motokariya was from Kagoshima Prefecture and became a member of the Navy's Hikō Yokaren (Preparatory Flight Training Program) 17th Otsu Class. After completion of training, he was assigned to the 262nd Attack Hikōtai. He was a navigator/observer in a Ginga bomber (Allied code name of Frances) with a crew of three. Motokariya wrote the following last letter to his older brother. The end of the letter includes two poems. Dear Older Brother, please be glad. Now I have been selected as a Special Attack Corps member, and finally tomorrow I will make a sortie. The time has come for this body that I received from our parents to do something useful for the Emperor. For a young man there is no long-cherished desire that surpasses this. I am resolved to go smiling and crash into a ship. Flying over surging waves for a thousand miles, the bull's-eye unit will launch an attack on the enemy position. There is nothing that brings such delight. I think that you also will be glad about this. We are an attack unit who will not return alive. I am grateful for what you did for me when I was in Izumi. I very deeply appreciate it. Even though I die, I will not forget your kindness. Please give my regards also to my older sister. As there is a song with the line of "Born a man, when I go to the skies, I have no regrets if I turn into a corpse that colors the clouds," our long-cherished desire is to die honorably at the end of the skies. Cherry blossoms are loved and respected by people in the world because sadly they fall. For people also who fall, it is good when they are missed by others in the world. A fine end cannot be achieved if the place of one's death is missed. Even though I die, please do not be sad and praise me for my admirable end when I died for the Emperor. From the grave I pray for the health of you, Older Sister, Ken-chan , and Kei-chan. On March 11, 1945, Motokariya took off from Kanoya Air Base toward Ulithi in one of 24 Ginga bombers in the Azusa Special Attack Unit. His Ginga bomber made a forced landing on Minamidaitōjima, a small island about 400 kilometers east of the Okinawan mainland . One week later he took off from Tsuiki Air Base in Fukuoka Prefecture. The above letter is not dated. Most probably it was written before he departed from Kanoya on his first special attack mission. The letter and biographical information on this page come from Kanoya Kōkū Kichi Shiryōkan Renraku Kyōgikai (2003, 23). 1. The suffix chan is often added to children's names when calling them by their given names. Kanoya Kōkū Kichi Shiryōkan Renraku Kyōgikai (Kanoya Naval Air Base Museum Coordinating Committee). 2003. Kokoro no sakebi (Cries of the heart). Kanoya, Kagoshima Prefecture: Kanoya Kōkū Kichi Shiryōkan Renraku Kyōgikai.